All together now: "When Captain America throws his mighty shiel--" ...Oh, isn't he? Near enough. Young marine, Henry Heywood, was severely injured in an attack on his base during WWII. Heywood's former biology professor saved his life with a series of surgeries, replacing his skeleton with a steel alloy frame and attaching micro-motors to his joints. Now with superhuman strength, stamina, speed and invulnerability, Heywood returned to wartime action as the costumed hero Steel, battling saboteurs at home before heading to overseas theatres as a covert operative. Lest the bio lead you astray, let's clarify: Steel's adventures were set during The Great War 2: Nazi Boogaloo, but they weren't written until 1978, so in spite of his Nazi-punching habit he's not one of those Golden Age heroes who've been around forever. It's kind of peculiar that you don't get more period comics from the big publishers these days - you'd think they'd be falling over themselves to play in fun eras like WWII and the Cold War. I guess in DC's case they've got enough problems with explaining what passes for history on post-Crisis Earth without inventing more - or maybe it's just that our boy here's effort, Steel: The Indestructible Man, managed all of five issues before shuffling off to the great paper recycling bin in the sky. 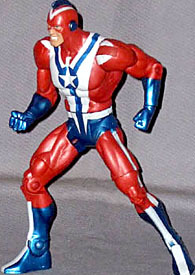 He may not have set the world on fire on his debut, but Steel - who became Commander Steel when Winston Churchill put him on the payroll - must've been a happy sight for Mattel when he clunked his way into their design office, since they've had to do the bare minimum to recreate him in plastic form. His body is just the plain ol' superhero male, with the usual ripped physique and slight creases around his fists, boots and underpants just to remind us that he's wearing clothes, not body paint. Ironically then, his costume basically is the paint job, which is all nice and clean and bright - but not too bright, with a slightly dull, flat red and a darkish metallic blue keeping him from looking like he was coloured in crayon. Besides some very minor smudges and spots, the only issues with the paint are that the inner discs of the shoulders and ankles have no white paint to match the white bands on the rest of them, and - this may be a one-off error - the stripe on the right leg doesn't line up right with the hole for the knee joint, which it's meant to encircle but in fact misses by a few millimeters and winds up overlapping the boot. The shoulders and ankles are obvious, but not a deal-breaker, the leg is no big deal - unless you look closely you don't really notice it. 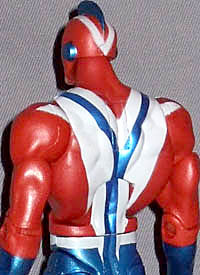 If you turn him around, you'll also see that the cape/backpack/whatever port in the figure's back has been filled up with a plug, which leaves a visible seam. Since it's the only new bit of him, the head is pretty important, and luckily it looks pretty good too. Steely's wearing a Cap-like half face hood mask, leaving his jaw free to scowl heroically (he definitely looks pissed about something), and besides the big goofy Flash Gordon ray gun fin on top of his head, he's got discs covering his ears. The white of his clenched teeth is a bit over-zealous, extending a crucial fraction too far to the right side, but otherwise the face and mask is good work. Thanks to the angled action pose he's been jammed into his packaging in the head fin has bent slightly to the right, but it's not really visible unless you look at him from directly ahead. Sculpturally, Commander Steel is a perfect match for his grandson Nathan Heywood, who became Citizen Steel in the relaunched Justice Society of America. His costume paintjob is similar but not identical, though he'd be easy fodder for a customiser; I'd be surprised if Mattel themselves don't roll out a Citizen Steel repaint at some point (if they wanted to be really fancy, using metallic paints all over, assuming they can drum up a metallic skin colour paint). 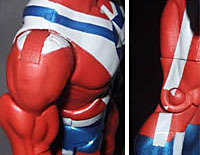 Same body, same articulation: ball joint neck (a little stiff due to the way the edges of the joint rub together), swivel/pin shoulders, swivel biceps, pin elbows, swivel wrists, pin sternum, swivel waist, swivel/peg hips, low thigh swivel, pin knees, pin ankles. Steel doesn't have any accessories - nor can he hold any, with his clenched fists - but a neat little custom touch is that the tray he fits in as part of his packaging has a stars and stripes pattern molded into it. He does come with a Giganta bit, and fitting in with the law of conservation of plastic, or whatever they use to decide these things, it's the most weighty bit, the torso, including the leopard skin skirt and one-shoulder sports bra. Judging by the size of the sports, that must've been one hell of a leopard. There are elements of Commander Steel that I'm impressed with - it's a good sculpt, and its reuse isn't a drawback since the character design doesn't demand anything more, plus the paintwork is mostly good. But in the absence of accessories or a fancy costume or, well, anything besides the basic paint job, really, I'd have liked that paint job to really pop, and as is, it's good, but not "wow" good. Call it a solid passing grade for Mattel, but not a knockout.